Posted 8/31/2011 10:21pm by Miranda Combs. All STEAKS can be cut to order so please call farm by Thursday evening to ensure you get them exactly the way you like!!! Posted 8/24/2011 2:44pm by Miranda Combs. I am on vacation up in the adirondacks this week, so will only be sending out pne message this week- comibing the Kennedy Meat Stand Update with the general market. Any item you need can be cut to order if called in to farm early enough in the week. There will be a great variety of locally grown vegetables and summer fruit. This week we will see lots of varieties of tomatoes including heirlooms. Peppers are also in their prime and many varieties are available. There will also be great fruit, especially in the mellon department- honeydew, canteloupes and of course watermellons. The peaches, both local and from Chambersburg, are fantastic. Please enjoy them while you can. You can stop by the Greenawalts, Kennedy, Kistaco or Zang booths. 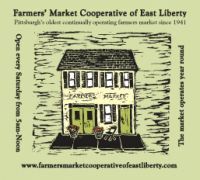 Please also remember to stop by the PA Made Cheese booth for locally made artisinal cheeses, and the California Olive Oil Connection for "local" extra virgin Olive Oil. These are great accompaniments for the local meat and vegetables available at the market. We just received a fresh shipment of goat cheeses from Sam and Susy Byler from Riverview Dairy. The Kew Park Coffee Bar will have iced coffee, fresh squeezed lemonade and limeade. Please stop by to see us this Saturday. Posted 8/18/2011 9:54pm by Miranda Combs. I spoke to a few of the farmers this week. All I can say is that we are definitely in the prime of summer. There will be a great variety of locally grown vegetables and summer fruit. This week we will see lots of varieties of tomatoes including heirlooms. Peppers are also in their prime and many varieties are available. For example, every week we get a delivery of fresh cheese curds from Arsenal Cheese. I would suggest that you prepare them as you would with fresh Mozzarella- Slice some tomatoes, top with fresh cheese curds and drizzle on the CA Olive oil. Finish with chopped basil. Serve it with a steak. Yum! Posted 8/17/2011 8:45pm by Miranda Combs. -We still have one half of beef show steer available in cut wrapped and frozen form. This is our last offering of this type for the year and you can choose whatever cuts you want! We include the clear vacuum packaging cost this time. The Kennedy children have been working hard raising their special show animals. The Butler Farm Show was last week and they did quite well in the competitions. Jacob had the reserve champion market hog. He also had the reserve champion market lamb to taylor' s grand champion market lamb. Jacon also had a steer place second in its class. It was an awesome week for us as exhibitors but not surprising as we know how much work, care, and love went into each animal project those children exhibited. Thanks to all of you who gave your words of ecouragement and praise...it means so very much!!! Posted 8/4/2011 10:31pm by Miranda Combs. There will be new fresh fruit at the market this week. The most notable items are mellons- watermellons and a variety of other types of mellons. Also, peaches from Chambersburg will be at the market. Pleas stop by the Greenawalt, Kennedy, Kistaco, and Zang booths for fruit and vegetables. Posted 8/3/2011 5:24pm by Miranda Combs. Posted 7/28/2011 9:31pm by Miranda Combs. I spoke with the farmers this week and asked them what to expect at the market this Saturday They all said "more of the same." Yes, more of the same wide selection of delicious locally grown fruits and vegetables. We are entering the prime of the season and the locally grown items are fresh and plentiful. Tomato's and Corn in particular are now in. Prices are also very reasonable. We should all start to think about "putting up" various items for the winter. Last Sunday I made my first batch of tomato puree from a large basket of tomatoes that I purchased at the market. Delicious! Speaking of putting things up, our friend Mariam Rubin is at it again with another installment of Miriam's Garden in the Post Gazette. Please check out her article which has a great pickle recipe. Miriam also mentions a pastry chef Susie Treon who makes desserts for Point and Park Bruge. Just by chance I was hanging out at Park Bruges in Highland Park last night and had the Apricot Tarte Tatin. It was to dies for. I thought I was back in France. Any ways, back to the putting things up topic. The farmers at the market can usually take orders for larger quantities of items that you can use for canning. So please put in your orders for baskets, bushels, or truck loads of veggies. Posted 7/27/2011 5:56pm by Miranda Combs. Remember we can have the cuts you want if call orders in early enough! Also, local LAMB is available again next week, August 6 th...please order now so you are sure to get the cuts you want!!! Posted 7/22/2011 10:40am by Miranda Combs. I was away this week so did not get to speak with the farmers. But the market will be open (heat does not stop us). And we should have a great selection of locally grown items available. So please stop by to see us this Saturday. Please note that we now have one of those cool circular bike racks installed in front of the building. So bike on in! Special thanks to Christine Berger from the Mayor's office and Emily Keebler from Patrick Dowd's office who made this happen! Posted 7/20/2011 10:43pm by Miranda Combs.